Can We Make Drinking Water Out of Ocean Water? Turning salt water into drinking water is possible through a process called desalination. It is, however, incredibly costly. 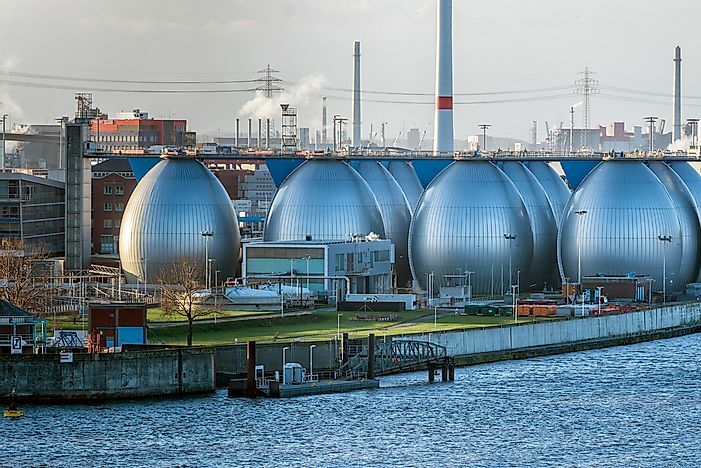 A desalination plant in Hamburg, Germany. Water is one of the most critical components to life on earth. Having safe and sufficient access to water improves overall health and encourages economic development. Millions of people around the world, however, are faced with a lack of access to clean drinking water due to climate change, urbanization, and a rapidly growing human population. How can so many people lack access to water when the majority of the world is covered in water? This is because most of the world’s water supply is found in seas and oceans, which are comprised of saltwater. The concentration of salt in the ocean is too high for the human body to process. If humans drink seawater, the kidneys would be forced to eliminate the salt by creating excess amounts of urine. More urine would be expelled from the body than water consumed, leading to dehydration and eventually, death. In order for humans to consume seawater, it must first be desalinated. Desalination is the process of turning saltwater into freshwater by removing its salt content. This water treatment method has been practiced since ancient times, when ship crews processed seawater for drinking water onboard. Today, over 18,000 desalination plants are in operation around the world. The traditional method of desalination involves boiling water and collecting the water vapor, which is free of the salt and minerals that are left behind. Other methods of desalination include: multi-stage flash, multiple effect, vapor compression, freezing, solar evaporation, and reverse osmosis. In reverse osmosis, seawater is first filtered to remove microscopic particles and organic matter. It is sent on for further cleaning with micronic filters before going through the actual reverse osmosis process. In this stage, water is pumped at 800 pounds per square inch in force it through electrically-charged membranes. These membranes remove the vast majority of the salt in the water. The water moves on to permeate storage tanks, where 20% is reprocessed via reverse osmosis before being mixed together again. This water is pumped through calcite filters, which add calcium and increase alkalinity. To be sent through municipal water lines, fluoride, ammonia, and chloride are also added before human consumption. Desalination seems like the perfect solution to the world’s freshwater scarcity problem. In fact, nearly 23 billion gallons of clean drinking water are produced every year by desalination techniques, enough water for approximately 300 million people. Kuwait currently fulfills its entire water needs with desalinated water. According to the UN, 1% of the world population depends on desalinated water. However, efforts to increase desalination projects around the world are cost prohibitive. The reason for its high cost is due to the energy required to produce desalinated water, which is approximately 3 kilowatts per cubic meter (depending on the method utilized). This is significantly higher than the energy required to process local water supplies, which is around .2 kilowatts per cubic meter. Additional factors that increase the cost of desalinated water include: location, facility type, labor, and concentrate disposal (the salt and minerals that are left behind after desalination). Desalination comes with some environmental concerns as well. In order to produce large amounts of desalinated water, processing plants require cooling water, which is obtained through water intake infrastructure. These intake systems may remove fish and other marine organisms from their habitat, sending them through the cooling system and harming them in the process. Larger marine life may become trapped at the water intake entrance, unable to escape the powerful suction that it produces. Saline concentrate disposal is another environmental issue. When this concentrate is disposed into the ocean, it sinks to the ocean floor, damaging the ecosystem. This page was last updated on May 30, 2017. Which Animals Can Live Without Water For Years? How Many Trees Does It Take To Make 1 Ton Of Paper? How Did Kudzu Make It to the United States? How Many Trees Does It Take To Make 1 Roll Of Toilet Paper?